POLICE used a “honey trap” digger to catch thieves in an operation which led to the recovery of more than £500,000 of stolen machinery in rural Cheshire. Between April and November 2010 there were 94 incidents relating to the theft of plant machinery, agricultural machinery, thefts from vehicles and of vehicles across Macclesfield, Wilmslow and Knutsford . The thefts were predominately from rural areas, farms and construction sites. It followed a spike in thefts of plant and agricultural machinery at farms and construction sites in rural areas around Knutsford, Wilmslow, Alderley Edge and Macclesfield. Some 94 incidents relating to the theft of plant and agricultural machinery – including stolen vehicles and thefts from vehicles – had been reported from April to November 2010. The thefts were mainly from rural areas, farms and construction sites – leading to hostility and a lack of confidence towards the police from the rural community. In response, police took steps to reassure local residents – and mounted a special initiative under the umbrella of Operation Gradual to bring the offenders to justice. The goal was identify who committed the offences, prosecute them, prevent them from committing further offences and deter other criminals from engaging in similar activities. Investigations were re-opened, evidence re-examined and links identified. The local rural beat officer also established that local police officers needed educating around the issue of rural crime – in particular plant and agricultural machinery theft. Adhesive stickers were used to reassure local farmers and remind officers to “stop-check” machinery nightly between 2000hrs and 0500hrs. Meanwhile, the Plant and Agricultural National Intelligence Unite (PANIU) was approached and a “bait” or “honey trap” digger was deployed in the hotspot area for the offences. With the PANIU assisting with 24 hour surveillance, the criminals took the bait with a suspect arrested 14 minutes after the honey trap digger was deployed and parked. The suspect was apprehended in a stolen Ford Transit van, with a stolen trailer and the honey trap digger in his possession. Other suspects were also arrested. Because of the magnitude and complexity of the case, it was prosecuted by Manchester Crown Prosecution Service rather than Cheshire Crown Prosecution Service. Cheshire CPS decided that that “conspiracy to steal case” fell outside their standard operating procedures to prosecute the case at short notice and called Manchester CPS to assist. The CPS also concluded that they were struggling with sentencing guidelines in relation to plant and machinery theft, despite victim impact statements submitted on the court file. In all, however, the operation led to 10 offenders being prosecuted – nine of whom received custodial sentences together totalling 14 years and 9 months. Stolen property recovered by police through the operation was valued in excess of £500,000, with proceeds of crime confiscation orders totalling £1,421,982. The arrest of this organised team of thieves and handlers resulted in offences virtually stopping overnight – with the offenders are now facing the consequences of their actions. The Plant And Agricultural National Intelligence Unit (PANIU) was approached and a “bait” or “honey trap” digger was deployed in the rural hotspot area for these offences. Following the deployment of the “bait” equipment, Police arrested a suspect 14 minutes after the equipment was stolen. He was in a stolen Ford Transit Van, with a stolen trailer and had the Police “bait” digger in his possession. The Plant And Agricultural National Intelligence Unit were very supportive of this projected and assisted with 24 hour surveillance of the “bait” equipment. Manchester CPS prosecuted this case because of the magnitude and complexity of the case. Cheshire CPS said that the “Conspiracy to steal case” fell outside of their standard operating procedures to prosecute this case at such short notice and therefore Manchester CPS provided a Prosecutor to assist. 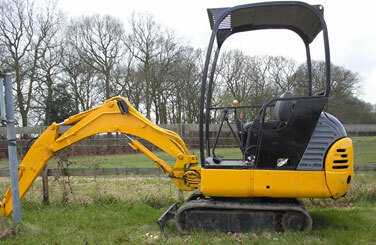 Therefore, the first “barrier” was with CPS education in relation to Plant machinery theft. Secondly, the CPS also concluded that they were struggling with “sentencing guidelines” in relation to Plant And Agricultural Machinery Theft. This was despite Victim Impact Statements being submitted on the Court File. FARMERS in the Knutsford area have praised the work of the town’s Rural Watch policing scheme after its work resulted in eight men being found guilty of stealing more than £2 million worth of farm machinery.